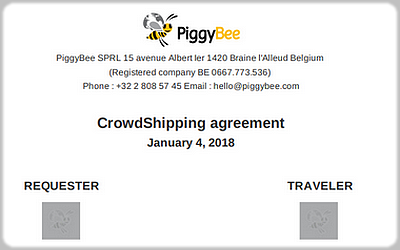 Once the payment has been made via our payment module, PiggyBee provides a contract between the requester and traveler and formalizes the agreement between the two parties. This document may be printed and used during your trips. In addition, this contract includes respective emails and phone numbers (if mentioned), which allows you to arrange practical and final details.